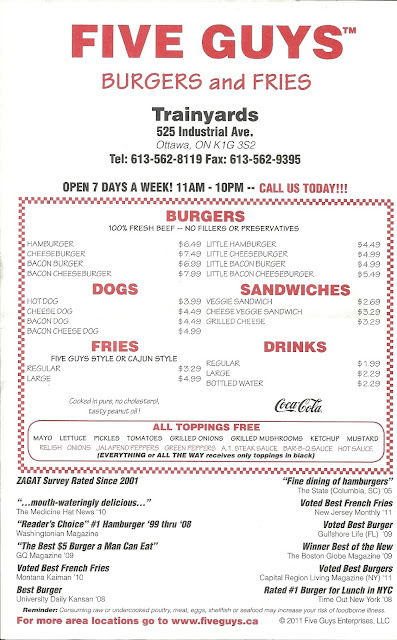 Today for lunch I visited Five Guys Burgers & Fries (525 Industrial Avenue, Ottawa). This was the third visit to this location which I've had mixed results with. The first visit, at the beginning of October, my wife and I visited this location as our first time ever to a Five Guys Burgers & Fries. After reviewing the menu, I chose a Hamburger, Large Fries and Regular drink. My wife chose a Little Hamburger and a drink. This came to over $25.00! It took a while as well for our food to be prepared as, like at T.C. 'S Fish & Burgers in Aurora, the restaurant makes it to order (i.e. you order, they start preparing your meal). Good thing my wife didn't order her own fries. The large fries are good enough for two people. My hamburger turned out to be a two patty burger with all the trimmings while my wife's small hamburger was a traditional single pattied burger. Overall, I used this first time visit to refine my order for the next two attempts. My second attempt was lunch at high noon on cold day. I entered the store to find a line up with the kitchen in full action. The line moved quickly, but the food took a while to come up, but not for a lack of trying by the kitchen crew who appeared to be a well oiled machine moving food through. I ended up hitting the road with my food as there were no tables available indoors and outdoors was too cold to sit on their patio or in the nearby well manicured grass. So I enjoyed my fries as I headed home in order to properly enjoy my meal. On my third attempt, today, I arrived early at 11:15 A.M. in hopes of beating the lunch time rush. Success! There were only a handful of customers there. I walked right up to the counter and placed my order with the cashier. The food took about five minutes to move from the grill, to the topping station, to the fries and to the customer. The only delay was a small wait for fresh fries to come forward. Of the three visits, this was the only time I've seen the fries not be ready unlike McDonald's or other fast food where it is a regular occurrence. I sat down and opened the nondescript brown paper lunch bag that all customers get in order to access my food. The bag had the usual old school grease stains due to it's occupants. The fries were all over the place in the bag. The kitchen crew first fills the cup full of fries, loads the bag and then dumps in even more fries on top to ensure you get enough. This obviously leads to the aforementioned grease stains on the bag. The fries were delicious! Freshly cut, fried and salted. The only complaint was the latter noted salt, too much in some cases. Add a little ketchup, and you are in french fry heaven. Added value was the sign at the front of the store saying "Today's potatoes are from:" with the name of two American located farms Washington. Quick note: Sure Five Guys Burgers & Fries is originally American, but is it not able to source some Canadian spuds perhaps from Ontario or Prince Edward Island, especially after the recent harvest? The burger was also equally delicious. I could taste the freshness of the in house made paddie from the first bight. The only complaint, the entire burger was smushed. I looked around to see if my burger was a one off. Nope, everyone elses burger also looked like a burger well handled by a five year old. This results in the toppings, especially the liquids, from bursting out of the burger even before the first bite. The decor is pretty much like the old school burger and fry locals you would find anywhere. Bags of potatoes here, free peanuts and associated shells there. The only real beef I have with decor is: Do you really have to show off your awesomeness at every turn via gushing media quotes, including in the washrooms? The quotes were little much. Overall, Five Guys Burger & Fries is a solid burger place to fulfill your burger and fries cravings. There are a couple of issues though that they need review. The only issue I had was the price, at $11.04 for a basic burger, fries and drink it was getting a little much. 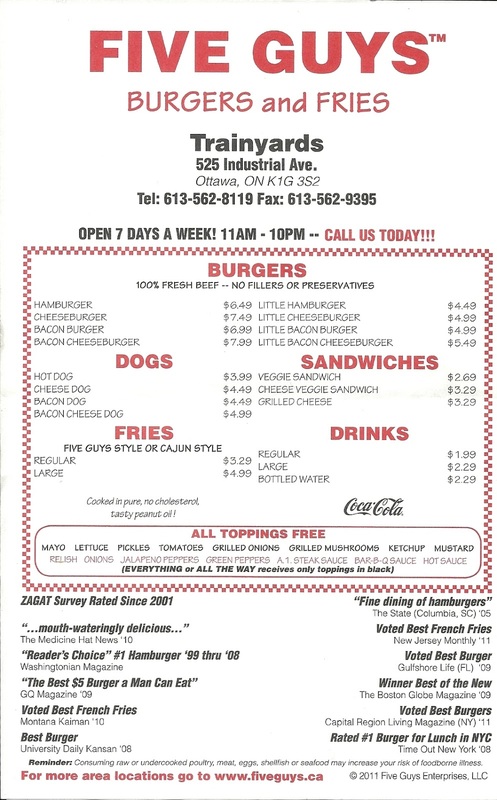 At least Hero Burger in Richmond Hill has their basic burgers, fries and drink $10.00 or less. The food and service is of excellent quality with everything prepared efficiently and quickly to ensure the customer receives their delicious food as fast as possible.